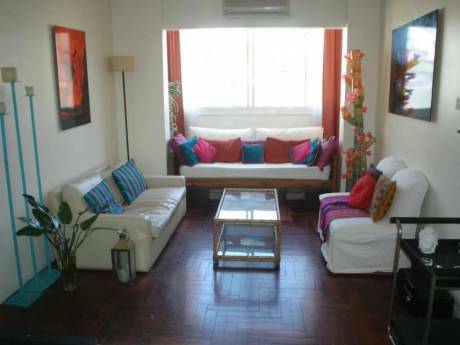 Our apartment is located right in the middle of Belgrano. The apartment is 110 m2, have 2 bedrooms with ensuite bathrooms, and is located on the 1st floor, with elevator. The location is perfect, as the area is plenty of restaurants and you have the subway and train a few blocks away, and convenient to all public transportation (taxis, buses). In the apartment everything is new and in good working order. The apartment have a 100 m2 terrace with Barbaque grill (Parrilla). The terrace it's really sunny and you can have breackfast/lunch/dinner in it. We have a housekeeper that comes three times per week. We also have a weekend home in a golf and polo club, near the city of Lujan, 40 minutes by car from Buenos Aires, and an apartment in Punta del Este (Uruguay), and maybe we can include both in the exchange. We are a young Argentine married couple (29 years old) and we really enjoy traveling. We doesn´t have children yet. Our neighbourhood it's really nice. We have a beautifull square one block away, and we are 8 blocks from River Plate Stadium. Our home it's close to the Lakes of Palermo, a really green and sunny place to visit.